It is with no great enthusiasm that I forced myself to read the latest Reform Scotland report. This time on pension reform. The format is predictable. A bold 'wake up' headline, some warm words and serious looking charts to reassure us that the proposals are reasonable, and then the sting in tail comes with the usual right-wing Neo-liberal solutions. This paper, written by a couple of investment bankers, is beyond brazen in its attempt to hand our pensions over to the very masters of the universe that got us into the current financial mess! The headline, dutifully churned out by a busy media, is that politicians have been sleepwalking to disaster on pensions, both state and public service pensions. Really? All public service pensions were renegotiated in 2008, then we had the Hutton Report, followed by the UK Public Service Pensions Act. That resulted in another renegotiation that is supposed to last for 20 years. It doesn't feel like sleepwalking to someone like me who has spent months of late nights negotiating pension schemes. On the state pension scheme, again the UK government consulted and then legislated for a new flat rate pension and other changes. If there is any sleeping it is Reform Scotland, but then again they are usually on a different planet. They tell us that pensions are unfunded. Not exactly true. Successive governments have decided to fund the state and many, but not all public service schemes, on a 'pay as you go' basis. The revenue comes in each year and the benefits are paid out. Not exactly unfunded, but there is no long term pot. Actually, the largest public service pension scheme in Scotland (local government) does have a pot, a £24bn one at that. Reform Scotland's brilliant idea is to turn all our pensions into defined contribution schemes and privatise them. The fact that this would drum up a massive boost in business for their pals in the finance industry, is I am sure just a coincidence! The problem is that they would charge us a huge amount of money for the pleasure of our much smaller pensions. It's not an accident that private pensions in the UK are such poor value for money. It's about structure, poor performance and excessive (often hidden) fees. Far from giving us 'control' of our pensions, we would be handing them over to the 'masters of the universe'. Defined contribution schemes put all the risk on the individual, not the employer or state that is better placed to absorb the risk. Call me old fashioned, but I prefer democracy any time! I will now shock Reform Scotland by agreeing with at least one small point in their paper. They propose flat rate tax relief for their new scheme. However, we don't need a new scheme to do that. Government tax subsidies for retirement saving are expensive, ineffective and regressive. Out of the £54 billion the government invests in tax relief, through income tax on employee and employer contributions, 58% goes to the top 10% of wealthier taxpayers (See Anna Rosso's NIESR blog post). As the evidence suggests that there is little need for such subsidies for wealthy people, we should therefore abolish higher rate tax relief. Because income tax is progressive, tax relief is regressive. By limiting tax relief to 20%, the government would save around £7 billion each year. Reform Scotland's crazy scheme is a recipe for pensioner poverty and huge bonuses for the investment bankers. But as they dreamt up this plan, that is clearly the planned outcome. “For the Labour Party and Which? to dismiss Ofgem’s fundamental reforms is to misunderstand the barriers to competition that we have identified and are tackling. In fact Ofgem’s reforms go further than Labour’s proposals for increasing liquidity, which they refer to as a pool. Labour’s proposals only relate to the short-term market, where the big six are already auctioning large volumes of power after pressure." The problem for Ofgem is that their reforms are far from 'fundamental' and far too late after years of dithering. A quick glance at energy stories in the media over the last couple of weeks illustrates the problem all too clearly. For example, the Engineering Employers Federation chief executive Terry Scuoler has said: "Rising energy costs represent a major threat to growth and could damage efforts to support and sustain long-term recovery. The UK cannot afford to pile even more unilateral costs on the manufacturing sector which is key to developing the UK's longer-term growth and stability. Many manufacturers now feel they are being severely penalised by high energy costs, some of which are being unilaterally imposed and are not shared by competitor nations." For domestic consumers Which? reported this week that faulty clocks on electricity meters means up to 3.9 million customers are paying too much for their energy. British Gas have been whinging about Labour's planned price freeze, but the company still made an average profit of £37.60 from its 15.2m customers. And the Chief Executive still took home a £5m pay cheque. British Gas increased its tariffs by an average of 9.2% in November as part of a round of winter bill rises across the "big six" energy companies. There have been 5.5 million complaints against the "big six" – EDF, Centrica, E.ON, npower, Scottish Power and SSE – last year. More than 800,000 customers are believed to have switched away from "big six" suppliers in just over a year. Even Energy secretary Ed Davey has asked Ofgem to consider investigating British Gas to see whether it is abusing its market power and therefore inflating profit margins. The result could be that the company, and other elements of the gas market are broken up to reduce the abuse of market power. Even when you try and switch supplier, as I have been trying to do this week, it is far too easy for the current supplier to block it and delay. I could go on, but you get the picture. Caroline Flint, the shadow energy secretary, in a retort to British Gas said: "It is not acceptable for companies to threaten that the lights will go out because they don't want greater transparency, competition and accountability. When markets aren't working government has a responsibility to step in. Labour's plans to reset the energy market will follow the price freeze in 2017 and help restore public confidence. The reality is that what investors care about is long term certainty." Actually, we need much more than tinkering with market mechanisms. We need to address ownership - introducing more community and local authority ownership of energy generation as is much more common on the continent. I set this out in more detail in the Red Book on Scotland energy chapter and I would also point readers to Andy Cumber's excellent book, 'Reclaiming Public Ownership'. Another approach is to look at a different business model from the current Big Six approach. This would be focused on delivering those services to consumers as efficiently as possible, and profits would come from providing consumers with a level of service while using fewer units of energy. In the face of low-customer churn, high profits and a small number of players, the energy market clearly requires redesign, far ahead of Ofgem tinkering. The only question is whether the political parties have the courage to take it on. So far only Labour is at least starting the journey. The myth of the 'sickie culture' is buried with the latest Office for National Statistics (ONS) data on sickness absence. “These figures prove that there is no such thing as a ‘sickie culture’, with the number days lost to ill-health falling as employers get better at managing sickness absence. Average sickness rates in Scotland are 2.2%, about mid-table for the UK. Lower than East Midlands, Wales and the North-East, but higher than London and the South-East. Low sickness rates in these areas reflects the younger workforce and higher proportion of senior jobs. 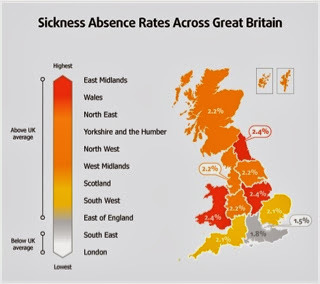 Of course managing sickness absence is not all good news. As UNISON Scotland surveys of sickness absence show, there is the growing culture of presenteeism – where unwell staff are pressurised into coming work by their bosses. This can prolong illness, spread germs and cause unnecessary stress throughout the workplace. A particular concern in public service workplaces like hospitals and in social care. A recent CIPD survey found that when looking at presenteeism, employees in the public sector were more likely (39%) to say they had seen an increase in their workplace than employees in the private sector (26%). 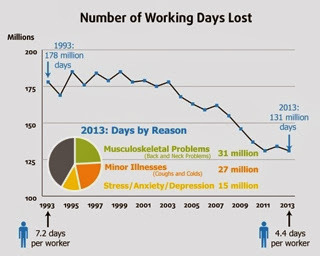 Stress is also under recorded in sickness absence data. Many conditions caused by stress are recorded in terms of their physical manifestation rather than the underlying cause. If we want to see sickness levels brought down even further, we should be concentrating more on prevention. Higher sickness absence rates amongst women and in repetitive jobs may suggest that flexible working, carers leave, better health and safety and imaginative job design could all contribute to lower sickness absence. On the subject of working hours this Friday (28 Feb) is 'Work Your Proper Hours Day' - the day when those who do unpaid overtime would start to get paid if they did all their unpaid work at the start of the year. The TUC has published a new analysis of official figures that show the number of staff doing unpaid overtime has gone up in the public sector over the last decade, but has held steady in the private sector. Unpaid overtime is more common in the public sector, with more than one in four doing unpaid overtime compared to around one in six of workers in the private sector. More than a quarter (27.4 per cent) of public sector staff did unpaid overtime of at least an hour a week in 2013, up from 24.8 per cent in 2003. The average amount of unpaid overtime done by these staff is 7 hours 42 minutes a week – 18 minutes less than in 2003. The increase in unpaid overtime across the the public sector over the last decade is almost entirely driven by more than a quarter of a million extra women doing hours for free. In 2003 a smaller proportion of women (24.3 per cent ) in the public sector did unpaid overtime than men (25.8 per cent). Women have now overtaken men with a big 3.9 percentage point increase in the numbers doing unpaid overtime to 28.2 per cent. The proportion of men doing unpaid overtime has barely changed in the last decade (up 0.1 percentage points to 25.9 per cent). So this Friday, make sure you work your normal hours. · Employment is the most promising way of tackling inequality. The biggest challenge is creating more and better jobs that offer good career prospects and a real chance to people to escape poverty. · Investing in human capital is key. This must begin from early childhood and be sustained through compulsory education. Once the transition from school to work has been accomplished, there must be sufficient incentives for workers and employers to invest in skills throughout the working life. · Reforming tax and benefit policies is the most direct instrument for increasing redistributive effects. Large and persistent losses in low-income groups following recessions underline the importance of government transfers and well-conceived income-support policies. · The growing share of income going to top earners means that this group now has a greater capacity to pay taxes. In this context governments may re-examine the redistributive role of taxation to ensure that wealthier individuals contribute their fair share of the tax burden. · The provision of freely accessible and high-quality public services, such as education, health, and family care, is important. We can't go on applying sticking plaster solutions to the thorny political issue of paying for local government. Services are being damaged and local democracy is being undermined. Today, I was speaking at a seminar organised by Edinburgh Labour on the thorny issue of local government finance. My primary message was that we need to develop a new consensus that provides a long-term solution. Politicians should take some comfort from the recent CoSLA poll that showed the public understand that good services cost money and freezing the Council Tax cannot go on for ever. As UNISON Scotland has highlighted many times, It is the better off that benefit disproportionately from freezing bills while councils face a growing problem providing services which, by and large, the less well off rely upon. In addition, charges are increasing to plug the gaps, which again place a further burden on those least able to afford them. To ensure that we all pay a fair proportion, all forms of wealth need to be taxed. The current system taxes wages more highly than other forms of wealth leaving ordinary workers bearing an unfair burden. Property is a significant form of wealth and must be taxed in order to reduce inequality. The well-off already own bigger and more houses than the rest of us. If this form of wealth is untaxed it becomes an even more attractive form of investment. This is the primary reason why a property tax should form the basis of local taxation. In 2007 the Burt Review looked at all the options in detail, but the main recommendation was shelved because it was so close to an election. The report recommends taxing the capital value of properties. In my view that recommendation remains sound to this day and should be the basis of a new Council Tax. Land Value Tax (LVT) has its supporters on the left and I can see some merit in this as a national tax, or possibly some element of business rates. LVT is a tax levied on the owners of land based on the value of the land excluding any property/fixtures on the land. One of the key issues with this tax is working out the value of land itself in order to then work out the level of tax due. Land is rarely sold without anything on it nor are buildings sold without the land underneath. This means that any bills will be based on an estimated value. There are real practical barriers to both valuing land and billing, as UNISON members working in this area have pointed out. Landowners are not as easy to find and bill as occupiers, particularly individuals and/or offshore companies hiding in tax havens. Landowners will be able to pass the cost on to tenants in higher rent charges. Local government should raise money from those people who live and work in their area, who use the services they provide to maintain local democracy. Wealthy landowners become the major contributors to local finance under LVT, yet have no interest in supporting local services. So even if the practical difficulties over LVT could be overcome, it is not really a tax suitable for local government. This still leaves the political challenge of changing any tax. There will be winners and losers and inevitably the losers make the most noise. It is possible to separate a structural change in local taxation from the rate at which the tax levied. Parliament could, if it so wished, reform the council tax on the basis of no increase in yield until the economy improved. That would at least provide a fair system of local taxation on which to build a broader consensus. The Scottish Parliament is today debating the 1st Stage report on the Procurement Bill. 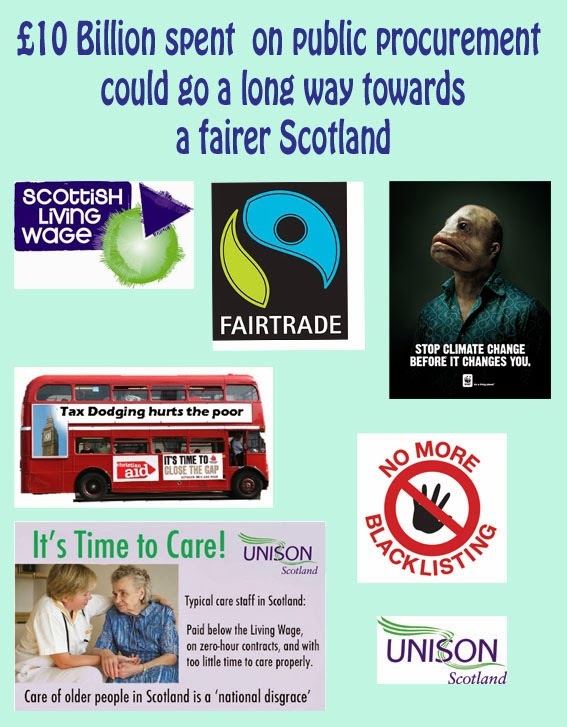 UNISON strongly supports the ten asks for the Bill from a coalition of coalitions of civil society organisations, including the STUC, Stop Climate Chaos Scotland and SCVO. Organisations with a collective membership of well over three million Scots. The asks include action on blacklisting and tax dodging, a sustainable development focus and measures on ethical/fair trade, employment standards and positive social outcomes. Sadly, Nicola Sturgeon’s letter to the ICI Committee gave little reassurance on addressing the asks with any changes to the Bill. It read like the work of a very tired civil servant, rather than a politically astute minister. Perhaps she is distracted by other parts of her portfolio! Yesterday we published a survey of care workers who described, in their own words, the shocking state of the care sector in Scotland. One of the actions necessary to tackle this issue is to use public procurement to roll out the benefits of the living wage to all those employed on public contracts. Commendably, much has been done in the public sector, but many services are outsourced to the private and voluntary sectors. This Bill is a major opportunity to make payment of the living wage a stipulation for all public contracts, by including this in performance clauses. The Scottish Government is hiding behind a badly drafted letter to the EU. We have produced legal advice that demonstrates clearly that this is possible within the EU procurement regime. Nicola Sturgeon, the Deputy First Minister, who introduced the Bill in October, told the SNP conference that, “We intend to make decent pay the norm, not the exception, in our rich country.” Not taking this opportunity now fails that ambition. Another ask we have highlighted today is stopping tax dodging companies winning public contracts. We ask, "Are Members on the side of the tax dodgers? Or will you take action to tackle them?" The ICI report notes that Section 23(3)(b)(i) indicates that regulations may provide that where an economic operator has failed to comply with an obligation to pay tax, the operator may not take part in a procurement exercise. The ICI report asks whether the Scottish Government has considered adding provisions to address aggressive tax avoidance as well as illegal tax evasion, as UNISON suggested. MSP's should call on the government to go much further than the UK Treasury/HMRC on this. As Richard Murphy of Tax Research has highlighted, the UK plans will catch only a handful of aggressive tax avoidance schemes. More than £10bn of public money is spent on contracts with the private and voluntary sector every year in Scotland. That money has the potential to do a lot for tackling inequality in Scotland. MSP's should be bold and use the ten asks to take some radical steps to use the public pound more effectively. Scotland, it's time to care! The care of older people in Scotland is a national disgrace. Fairly paid, well-trained staff on proper contracts with time to care is the very least older people in our communities have a right to expect. Today, I am speaking in a panel debate at Scotland’s voluntary sector event ‘The Gathering’, on this issue. UNISON Scotland has also today published a new survey of care staff, ‘Scotland – It’s Time to Care’. Like others in the sector I have written reports highlighting staffing levels, budgets, structures and care strategies. Words have been written and numbers crunched – but that doesn’t tell the whole story. I participated in a couple of focus groups made up of care workers last year and the messages from the workers who provide care were deeply disturbing. They painted a picture of care in Scotland that nobody would want for their elderly relatives, including my own. Having experienced those messages first hand I decided we would ask a much larger group of care workers and the outcome of that work is in today’s report. This report gives staff at the front line of care delivery the chance to tell their story about care in Scotland and it doesn’t make comfortable reading. The majority of workers believe the service is not sufficient to meet the needs of the elderly and vulnerable people they care for – both from the time they can spend and the quality of care they can provide. Almost half of carers (44%) said they were limited to specific times to spend with their clients. One in two workers are not reimbursed for travelling between client visits, while three in four said they expected the situation to get worse over the coming year. They also revealed that one in ten are on zero hours contracts. • Adequate time to care in every care visit. Scotland’s older people and others, who rely on our care services, deserve better. Water is a public good, not a commodity. Today there will be a hearing in the European Parliament on the European Citizens Initiative – Right to Water. You can watch the debate live online. Nearly two million people signed this initiative across Europe. It invites the European Commission to propose legislation implementing the human right to water and sanitation as recognised by the United Nations, and promoting the provision of water and sanitation as essential public services for all. The EU legislation should require governments to ensure and to provide all citizens with sufficient and clean drinking water and sanitation. In particular, it wants water supply and management of water resources not be subject to ‘internal market rules’ and that water services are excluded from liberalisation. This is particularly important in Scotland because we escaped the privatisation of water and sewerage services that happened in England and Wales. However, that doesn’t mean that the threat to our public service isn’t very real. Powerful commercial interests continue to lobby for privatisation, or the Trojan horse of mutualisation in Scotland. EU rules will be used as another excuse to pursue their agenda. The private sector already has a foothold in Scotland through PPP/PFI schemes and contractor partnerships. Scottish Water has recently unveiled a six-year £700million infrastructure partnership with four major companies, two of them US-based, to deliver its £500m-a-year capital programme. Further privatisation through the backdoor. Scottish Water is also regulated in Scotland as if it was a private utility. This not only ignores the public service function, but also adds extra costs onto the consumer. 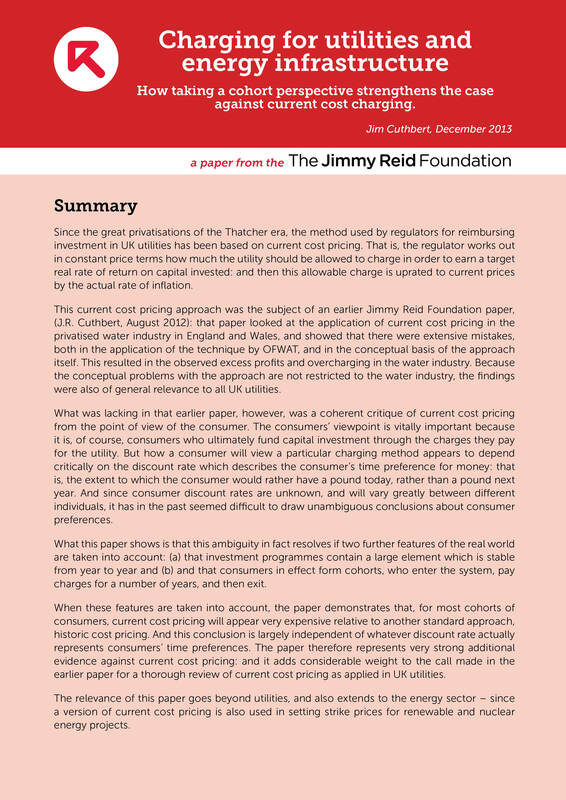 This is clearly set out in the latest paper by Jim and Margaret Cuthbert, published by the Jimmy Reid Foundation. Current cost pricing results in excess profits and overcharging across the water industry and parts of the energy sector as well. 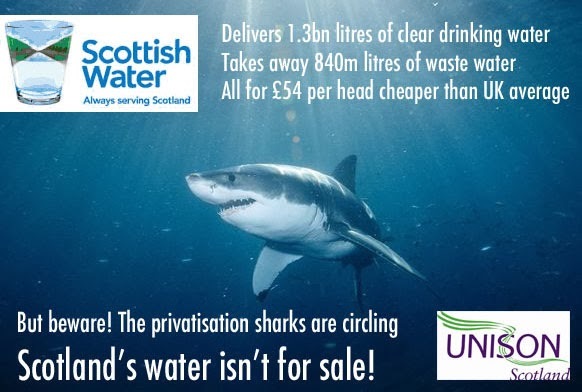 Campaigning against the privatisation of Scottish Water doesn’t mean clinging to the status quo. In UNISON Scotland’s paper 'It's Scotland's Water' we highlight other public service models that demonstrate that a more democratic structure can deliver a more efficient, socially responsible and more accountable public water service. We can develop more democratic forms of ownership that ensure there is a focus on the issues that matter to the public like leaks, repairs and water quality. Not creating an artificial market that concentrates on profit rather than service. As councils set their budgets for next year, the attention is on splits at CoSLA, rather than the impact of cuts in council budgets. As UNISON Scotland has highlighted today, it is local government that is taking the brunt of the cuts. This is illustrated by the fact that local government is the only major Scottish spending portfolio that has taken a cash cut since the crash. In addition job losses have been proportionally higher in councils than elsewhere. The Scottish Government can fairly point to Westminster austerity cuts as the underlying problem, but they also say they are protecting spending in councils. Self evidently, both cannot be true. At the risk of sounding like Thatcher, every worker facing wage cuts knows that they have to cut the family budget somewhere. The Scottish Government has chosen councils. The cynic might suggest this is because councils are further away from ministers - the 'not me guv' school of government spin. The problem is exacerbated by the Council Tax freeze. Of course no one like to pay taxes, but as the recent CoSLA survey demonstrated people are not daft. They understand that that you can't maintain services and have a real terms tax cut. 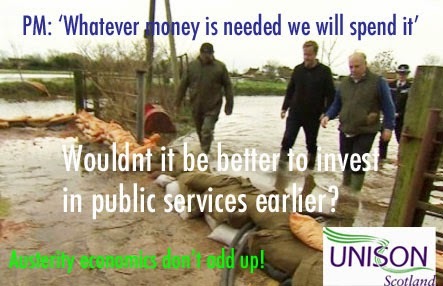 If the floods tell us anything, preventative spending is better than crisis management. I highlighted another example earlier this week - councils being forced to spend £1600 a day on pothole compensation because they don’t have the cash to repair the roads properly. 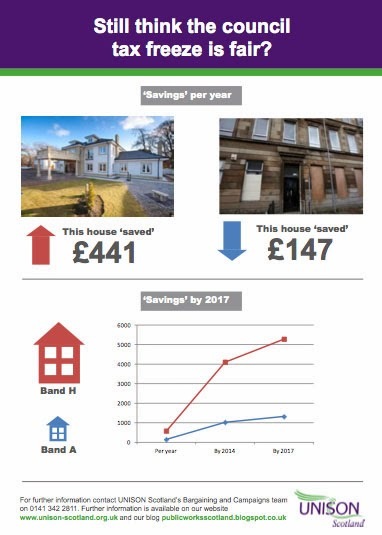 The Council Tax freeze is not even the best way to help hard pressed families financially - the social wage, as the Scottish Government likes to call it. As our infographic shows, it is the wealthiest households that gain the most - big time! Well UNISON Scotland is a pretty unlikely defender of CoSLA given recent pay disputes. We have also argued that it hasn't always been strong enough in arguing the case for local government. It is of course perfectly proper for councils to argue their corner on grant allocation. I would also argue that there is a strong case to look again at the formula to ensure that resources are targeted at areas of greatest need. Renfrewshire for example, made a strong case on this recently in evidence to the Scottish Parliament. To limit the inevitable council squabble, I would focus the formula on disadvantaged postcodes or wards, rather than the council as a whole. Even the poorest council areas have affluent areas and vice versa. I would urge councils, as I did today on the BBC, to use the procedures to resolve their differences without a break up of CoSLA. I understand the concerns over proposed changes in the internal decision making process. CoSLA, like many large membership organisations, is not always light on its feet and shifting decision making to the full Convention is not going to make it any more effective. However, keep an eye on the big picture. There is a need for a strong collective voice, across the political divide, making the case for local democracy in Scotland. The CoSLA, Strengthening Local Democracy Commission is at least a start. Remember the maxim divide and rule, because that is what will happen if councils don’t speak loudly with one voice. A couple of news stories this week illustrate all to clearly why it's better to invest in public services than roll back the state as the Tories are doing. Today we have the Prime Minister telling us, "Whatever money is needed, we will spend it”, as another 1000 homes are evacuated. UK Ministers fall over themselves to blame anybody other than themselves for their inadequate response. But the real lesson is not emergency responses, but rather why are we not investing in the services needed to prevent problems like this. As the PM himself said today, "We are a wealthy country”. Tell that to his climate change denying Chancellor. Our television screens have been full of communities pulling together in an effort to help themselves. However, the relief on one person's face when the public services arrived was all too clear. A wide range of public service staff have been working beyond the call of duty to help their local communities. The problem is, that if the Tories get their way and roll back the state, those staff may not be there next time. Another story illustrates, on a more mundane level, a similar failure to invest. 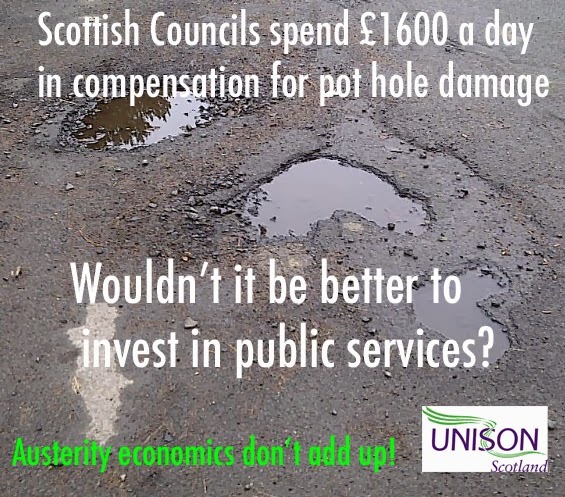 In what is becoming an annual story, Scottish councils spend £1600 a day compensating car owners for the damage caused by pot holes that they don’t have the funding to repair. Rather than compensating, we should be investing in council services. This is particularly true this week as many councils cut their budgets as a consequence of the latest government grant cuts. The key lesson from these stories is that austerity economics don’t add up. Good quality public services and preventative spending makes economic sense. Fiscal devolution would enable at least a modest challenge to neo-liberal economic orthodoxies, recognising that the SNP's approach to independence would operate within the constraints of fiscally conservative policies, particularly with its plan to reduce corporation tax. On the other hand, Devo Plus strategies that rest on the 'moral hazard' that occurs when a parliament spends but does not raise revenue, also adopt neo-liberal ideas and limit powers for redistribution. Fiscal policy should support the creation of a more equal society. The highly respected and certainly not right wing, Financial Times columnist Martin Wolf presents a pretty devastating analysis of the Scottish Government’s planned currency union. He argues that it would be folly for the rest of the UK to enter into such an arrangement voluntarily and advises Scots against it as well. Mark Carney, governor of the Bank of England, diplomatically stated last week that currency arrangements post independence “would be a matter for the Scottish and UK parliaments”. However, Wolf argues that as the person responsible for monetary stability, he has a duty to advise on the implications because the BoE would have to operate the union. Learning from “optimal currency area” theory and the recent painful experience of the eurozone, he argues there are two conditions for success. 1. A banking union with common supervisory standards; access to central bank liquidity and lender-of-last-resort facilities; common mechanisms for “resolving” banks in difficulty; and a credible deposit guarantee scheme. This would probably be accepted by the Scottish Government, or at least by John Swinney who has said as much in interviews. 2. Shared fiscal resources and arrangements. This is the big stumbling block, as it undermines the case for independence. If you can’t set your own taxes, what’s the point? Of course Wolf is not the only person to point this out. I would modestly point to my own chapter in the ‘Red Paper on Scotland 2014’ and an earlier article in Scottish Left Review and a Red Paper pamphlet. In today’s Scotsman, Brian Wilson makes a typically robust swipe at the concept, highlighting unusual common ground with Jim Sillars, who is equally robust in his new book. The pro-independence Cuthbert’s have also argued against the currency union in their paper. This debunks the claim in ‘Scotland’s Future’ that: “An independent Scotland will be able to decide our currency and the arrangements for monetary policy.” Wolf describes this as ‘nonsense’. Even worse, Wolf argues that it would be necessary to impose fiscal discipline on Scotland, while the rUK would need to retain the ability to use fiscal policy in crises, as it did in 2008 and 2009. The currency we use is not an academic side issue in the constitutional debate. It is the basis for a credible monetary and fiscal policy. Plan B is long overdue!